We all love those pretty, colorful yarns that we can buy in an almost endless variety of shades, ranging from muted neutrals to neon brights. Whether solid or multi-hued, we can usually find just the right colors we want to create eye-catching crochet projects for ourselves or our family and friends. Many of us don’t often think about what the dye mixes or color classifications printed on yarn skein bands actually mean. We just know whether or not we like a particular color and if it’s absolutely perfect for that special project we want to crochet. But have you ever wondered what some of those unusual color names on yarn wrappers mean? The colors may be lovely, but were it not for the benefit of having the yarn in your hands to see the actual color, you might not have a clue what the shade name means. Test your color savvy by seeing how many of the following names you can match with their descriptions. 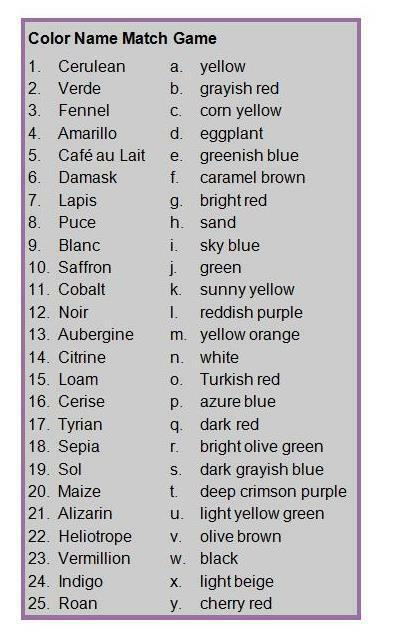 I hope you’ll find this color-name game both fun and informative, and the next time you buy yarn with an odd-sounding shade name, you might actually know what it means! The answers are at the end (no fair peeking!). Color Name March Game Answers: 1 i; 2 j; 3 r; 4 a; 5 x; 6 b; 7 p; 8 q; 9 n; 10 m; 11 e; 12 w; 13 d; 14 u; 15 h; 16 y; 17 t; 18 v; 19 k; 20 c; 21 o; 22 l; 23 g; 24 s; 25 f.